Design is the philosophy which makes a society evolve. It is also the essence that differentiates our individual abilities to grasp aesthetics, time and space. Whether it is nature, art or consumer products, the presence of design is inevitable. Personally, design to me is the rhythm of the times that we live in; it is what will define us in the eyes of future generations. I believe that in order to design, it is imperative to understand how the world works, to unlock the mysteries of different schools of thought, investigate into the minds of thinkers before our times and, most importantly, explore the full bandwidth of education. The best designs always display a balance of aesthetics, function and a good use of resources. I find working individually with a customer to create something that does not exist, and from scratch, a fascinating challenge. This is precisely why people like me exist. To me, the interaction with the client, whether for an apartment that is to be designed or a necklace that is to be sketched, is intoxicatingly beautiful and challenging. Holistic education is thus what I sought when I delved into robotics and anthropology at Hampshire College in Amherst, Massachusetts and then art and philosophy at Marlboro College in Vermont, before taking on the world of fashion at the Parsons School of Design in New York. It was a calculated move and it was not as if I was looking for my true calling which, somehow, I always knew to be fashion. After graduating, I worked with Donna Karan and Oscar de la Renta. Working with Mr de la Renta, as his assistant from 1992-4, I found that the job was not merely about designing! Generously endowed with a flawless sense of style, Mr de la Renta was a master in understanding the social atmosphere in any locale and always maintained that fashion—a social phenomenon that is conducive to changing society and its evolving mindset—is a celebration of life. It was a privilege to have worked under an icon like Mr de la Renta who sadly passed away on 20th October this year. It was always very important for me to weigh my calibre on a global scale rather than a regional one. I spent over a decade in America and much of it was spent in New York. It was an experience that shaped my character and my thinking, giving me an understanding of global design. My exodus to America was an attempt to garner world-class experience; and hailing from a small city, this was the perfect opportunity to gain worldly knowledge and develop my personality, which could help me in building a legacy later. I returned from America in 1994 on an invitation from my cousin, Maharaja Gaj Singh of Jodhpur, to do a show in Jodhpur, which apart from being known for its rich culture and tradition is also where I was born and raised. The experience of putting together the fashion event and getting to know the Indian retail climate gave me reason to believe that it was a good time to relocate and set up the building blocks of my brand. A designer is mostly inclined to design for the terrain and landscape that is part of his social milieu. And since mine had changed abruptly from western to Indian, there was a logical departure from the sensibilities of New York, though our creations today embrace a combination of Indian and Western looks, both of which are our strengths. Having said that, the ability to think beyond one’s locale and thereby realising one’s dreams is a self-gratifying experience. As a designer, I feel it is important to understand how things come to be. The form, the shape, the appeal and the integration of various components that build value for the product and make it appealing makes for a great study point. This is why we have invested hugely in technology to revive the techniques of the past which turned out meticulously handcrafted, exquisite apparel—lined with gem-studded buttons—for maharajas back in the day. But with the fashion industry moving on to the online and mobile platforms, it is equally imperative to adapt one’s products and styles to suit the markets of the future. Also important is the perfect balance of craft, quality, packaging and purpose of a product, which defines its place in the high-end luxury marketplace. Its design and appeal arouse desire, which is eventually economised. Traditional values—like Rajasthan’s rich heritage and vibrant culture—can be integrated into these products that can become classic, timeless and exorbitant in value—such as the Hermès “Kelly‘’ bag and the classic Chanel No.5 perfume. Thus, reviving heritage clothing like the Jodhpuri bandhgala jacket became symbolic of the brand. Our mood boards are completely inspired by the old world but juxtaposed with the most modern cuts and tailoring. Our focus will always be on building a luxury brand that reflects a strong essence of Rajasthan, but in the context of the present trends in fashion. The Jodhpuri bandhgala jacket, waistcoat and breeches are timeless heritage clothing. We contemporise each piece, to some degree, with trims, patches and embroidery after each season. With a plethora of products competing feverishly for the same space, it is important to add value to a product so that it emotionally connects to one’s brand. This can be achieved through customisation. Clients, at times, like to be involved in the creative process by offering inputs like family totems or their favourite colour. 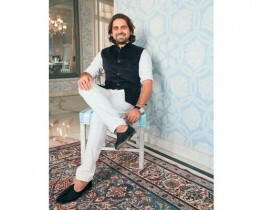 The Raghavendra Rathore label is a design house and not just a menswear custom tailoring brand. The 1,200 years of my ancestry are the foundation of my brand, but without the pomp and show that comes with it. We believe in understanding our customer holistically which requires us to dwell on a 360-degree design approach that is a complete lifestyle offering in terms of design. This encompasses all aspects of design, from fashion and products to corporate dressing and gifting. Fawad Khan’s look in the Bollywood movie Khoobsurat gives you a sense of the diversity of design that our work entails. Another crucial part of our services is designing customised weddings, which involves the décor, the groom’s wedding attire, invitation cards and menus, too! We expect to have a better presence across India in the near future with a better selection and, more importantly, by emphasising the Raghavendra Rathore label as India’s first luxury heritage brand. We plan to continue to expand our portfolio of offerings and aim to become a one-stop solution for all bespoke wardrobe needs. Accordingly, we have recently launched a men’s jewellery line and are currently working on a handmade bespoke shoe collection. India is on the cusp of recognising the value of design again. It was one of the most important aspects of ancient Indian life. But after the 1940s, a sudden setback—perhaps attributable to enforcement of the English view on design—changed the way we see design, causing us to lose our connect with our inherent design values. The last few years are a testament to the big change that fashion has seen, with the East meeting the Far West, and a sense of patriotism and ownership of Indian designs pervading the air. A sense of exclusive style and the urge to be modestly different and ahead of the pack by customising one’s look are the key elements that define the modern Indian man. A big departure from the conformist to the investigative or experimental individual is the trend of the decade. I have, for years, petitioned to have a Ministry of Design, a body that would be responsible for well-planned cities and products, and design, in general. The FDCI, which was set up by a handful of us almost two decades ago, gives better direction to the next generation of designers by offering them a platform to showcase their talents. Encouraging young talent to make the right decisions about their resources and working with them to improve their bottom lines has always been part of our brand ethos. For example, encouraging designers to associate with weavers in Varanasi is an important aspect of our present strategy. We also work to empower hard-working NGOs and help them create and optimise business plans through collaborations. Most of these are dedicated to upliftment of women in Rajasthan. Another objective of the Raghavendra Rathore design team is to incorporate elements from these partner NGOs’ works into beautifully embroidered Jodhpur bandhgalas, waistcoats and kurtas for the quintessential socially-conscious man every season. Sharing our knowledge and providing the NGOs with the means to achieve financial and social stability eventually helps the bottom rung of society. Our facilities are located in Gurgaon and Jodhpur and employ over 80 karigars and tailors who specialise in various crafts.